Page 2, Line 36 says that the legislature will phase in a constitutional level of funding over the next six years. This is similar to the stalling tactic the legislature used in 2009 when they approved the prototypical school model which acknowledges the actual cost of running schools - but delaying funding for this model until 2018. Delaying funding the actual cost of schools for six more years is not acceptable. Our Supreme Court has repeatedly said that 2018 was a firm deadline. Our kids cannot wait for 6 more years to have their constitutional right for an education to be delayed. The time to fund our schools is now. Page 8, Line 33 raises the minimum pay for starting teachers from the current $36K per year to $45K per year. This is far below both the 2012 study and the 2016 study by the State legislature both of which recommended raising the starting pay of teachers to about $55K in current dollars. To finally address our Teacher Shortage crisis here in Washington state would require an additional $2 billion per year and this is what our legislature has been promising our Supreme Court ever since 2012. Now at the last minute, the Democrats plan comes in and only offers $45K per teacher (which is only one billion dollars in additional funding). Even worse, the Democrats proposal does nothing to address class sizes and in fact may wind up forcing school districts to raise class sizes if funding is not provided to pay these teachers. This comes at a time when our kids are already forced to endure the highest class sizes in the nation. It has been estimated that fairly paying our existing teachers would require about $2 billion per year in additional revenue. Where is the $2 billion in additional revenue? Page 10, line 14 describes the process for “rebasing” teacher salaries every 6 years. This is little different from what the legislature did in 2012 – and then ignored – and then did again in 2016 – and again has ignored. It does no good to set up a process for adjusting the pay of teachers for inflation if the legislature keeps repeatedly ignoring that process. What teachers need to stay in this profession is certainty that their actual wages will keep pace with inflation and are not at the whim of being gutted by some future legislature. Page 13, Line 21 continues the current system of extremely high local property tax levies which our Supreme Court found unconstitutional more than 30 years ago precisely because it creates a system of property rich schools that can pass local levies and property poor school districts that cannot pass local levies. This system of rich schools and poor schools is unfair to our kids and unfair to local homeowners who have seen their local property taxes more than double during the past 30 years as the levy lid rose from 10% in 1980 to more than 24% today. Our legislature repeatedly promised our Supreme Court that this system would end by 2018. It is time to end this illegal and unfair system. Page 18 to 21 outlines the Prototypical School model which reduces class sizes slightly and provides things like school nurses and counselors in every school. Numerous studies from the legislature and OSPI have concluded this will cost an additional $4 billion dollars. So where is the $4 billion we were promised for the 2018 school year? Page 25 Line 18 continues to move the Class Size Initiative back to September 2022 . 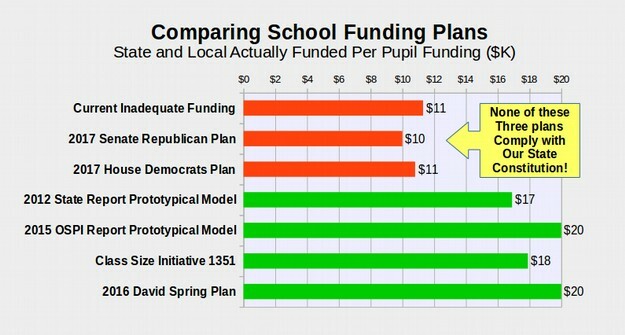 I agree with the Republicans in the Senate who have claimed that the Democrats plan is not really a plan because it does not even mention how it will pay for the Prototypical School model described in their bill. There is not one word in the Democrats plan about actually providing any additional state revenue to fund our public schools. Governor Inslee has proposed a “carbon” tax that would raise about one billion dollars per year and a capital gains tax that would raise about a half billion dollars per year. Neither of these are even mentioned in the Demcrats bill. Even if both were included in the bill, it would not come close to actually paying for the bill – thus leaving a hole of billlions of dollars in coming budgets – just like the Republican plan leaves a hole of billions of dollars. I have repeatedly advocated for a new law requiring that any bill changing any aspect of current state law must also define exactly how much the change will cost and then provide a means for paying that additional cost. 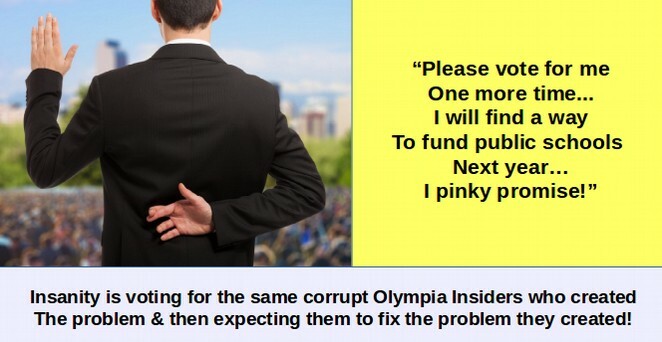 We need to end these fake bills, shell games and con games if we are ever going to fund our public schools. This is going to be difficult since the Democrats have not yet really submitted any kind of funding plan and since both the Democrats plan and the Republican plans are short billions of dollars from being able to fund even current levels of class sizes. With this understanding, let’s clarify the Republican Plan compared to current state spending. Currently, state spending is about $9,200 per pupil. In addition, the state average is $2,100 per pupil in local spending. There is also $1,100 per pupil in federal spending but it is not proper to include this in total spending because the feds have all kinds of strings attached to their gift and can remove it at a moments notive. Thus, the real total is about $11,300 per pupil in state and local spending. This results in the highest class sizes in the nation and the third lowest teacher pay in the nation adjusted for the cost of living – which is partly why our Supreme Court has determined this level of funding to be unconstitutional. Here is a chart provided by the Republican Caucus outlining how their plan compares to current spending. By “Other Local”, I assume they are talking about fund raising from the local PTA . I know that in my daughter’s school district (the Snoqualmie Valley School District) we often had fund raisers to pay for books, paper and even entire teachers. Nearly all of the fund raisers were to pay for basic education and to make up for the fact that the State was refusing to pay the actual cost of funding our schools. Even with these fund raisers, we still had the highest class sizes in the state and in the nation with 35 and even 40 kids in a class. It is not at all appropriate to include PTA spending in the total because it varies across the state and is not a reliable source of revenue. Looking at just the State and Local Levy part of the Per Pupil Proposed Law section of the above table, the Republican Plan would raise the state contribution from $9,204 per student to $9,837 per student (Actually Senate Bill 5607 says that the minimum state guarantee is $10,000 per pupil - see page 7 line 29). The bill then replaces the current average local levy of $2,070 (which varies across the state widely) to a consistent $1,853 per pupil. Republicans claim that net effect is an increase in funding. But in fact, it is a reduction in funding because they do not provide any way to pay the full cost of the Permanent Levy or the increase in the State Per Pupil allocation. This shortfall is more than one billion dollars or about $1,000 of each of our state’s 1.1 million students. Thus, their actual plan is not $13,207 (which includes PTA money and federal money). Nor is it even $11,300 current per pupil spending. Instead, it is a drop in funding about $1.3 billion dollars - from the current level of $11,300 to about $10,000 per pupil. This would require firing about 14,000 teachers. 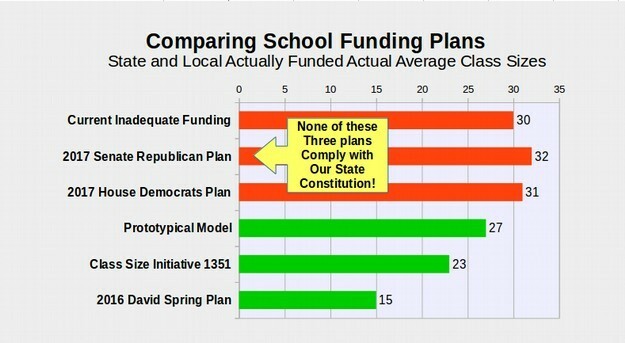 Even worse, the above table is not even remotely correct because the Republican Table column for “Current Law” does not include the prototypical school commitments promised way back in 2009 or the Class Size Initiative 1351 Commitments both of which are still in current law. 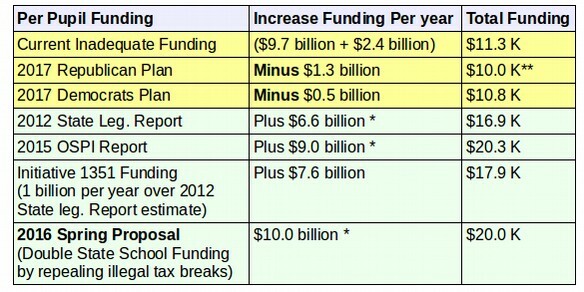 When these two commitments are added to the current funding levels, even after subtracting the Levy Cliff which is also part of current low dropping the Levy Lid back to 24%, the actual current law is $9.7 billion plus $2 billion in local levies (at 24%) plus $5 billion from the Prototypical Schools Promise plus one billion from the Class Size Initiative or $17 billion. 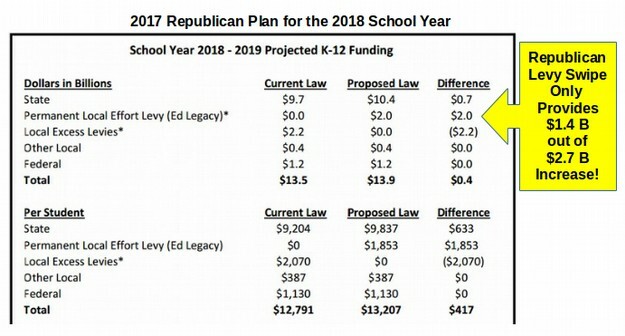 Thus, the Republican plan is actually a reduction in funding of about $7 billion per year and a reduction in per pupil funding of about $7,000 per student from the real current laws. 2012 What is a Protypical School and How Much Does It Cost? The prototypical school model is simply a way to estimate how much it actually costs to pay for an actual school. It includes not only the teachers but also a school nurse, a school counselor, a Principal and office staff as well as the cook and custodian and money to pay for books, paper and transportation to and from school. Schools are not required to hire all of these people. But the money is put in place to pay for what a “typical” school actually needs. Thus, the legislature and our Supreme Court have known since 2012 that the actual cost of running our schools was more than $15 billion per year or about $15K per student. You can see that he also included that for the 2017 school year, the actual cost was about $6.7 billion more than the $9 billion currently being alloted by the legislature – for a total of $15.7 billion. This did not include school construction funding. 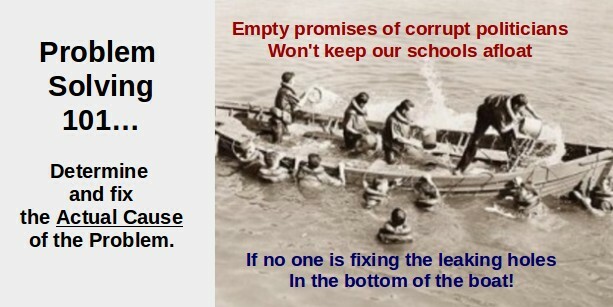 We have a $30 billion school construction backlog with half of our schools not even meeting the health code standards. When this is added, at $3 billion per year for the next 10 years, brings school operation and construction to an additional $10 billion per year or a total of $19 billion per year. This number is significant because our State Constitution clearly states that all matters related to public schools shall be supervised by the elected Superintendent of Public Instruction. Thus, it is not up to the legislature to determine how much the actual costs of our schools is – it is up to the Superintendent of Public Instruction to determine the actual cost. The actual cost is about $19 billion per year. Both the Democrats and the Republicans are once again ignoring this actual cost. How much to the McCleary Plaintiffs say it actually costs to operate our schools? Because the legislature has been ignoring the actual cost of funding our public schools for more than 20 years, in 2007, the McCleary Plaintiffs filed a lawsuit which they won in 2009 and which our State Supreme Court upheld in 2012. The McCleary plaintiffs have consistently reminded the legislature and our Supreme Court about the fact that our State Constitution has the clearest language of any State Constitution in the nation regarding school funding. This language requires AMPLE funding as a PARAMOUNT DUTY. Ample means more than just adequate. Paramount duty means the most important duty. “This Court’s January 2012 decision held that the State cannot declare “full funding” for any component of the State’s basic education program if the State’s funding formula leaves part of a school’s actual costs to implement that component unfunded… The State assured this Court that ESHB 2261 required the State to implement new compensation funding formulas as their technical details were established by ESHB 2261’s technical working group. 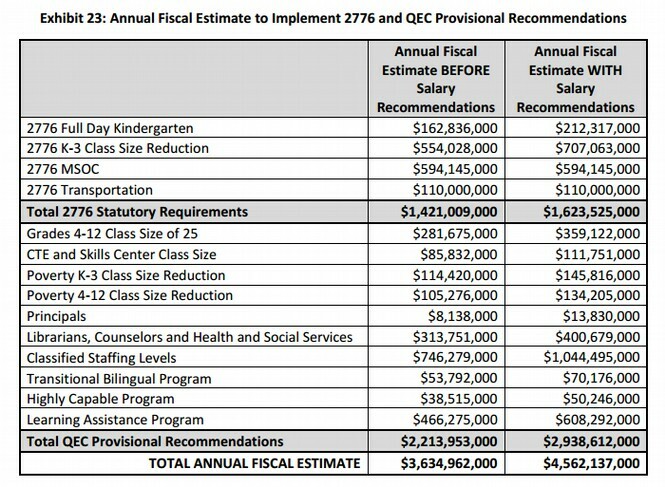 ● That technical working group’s June 2012 Final Report determined the salaries needed to attract and retain competent K-12 personnel required an over $2.9 billion/year compensation funding increase above the many years of accumulating Cost Of Living Adjustments (COLAs) mandated by Initiative 732, and stressed that “immediate implementation” is needed “in order to attract and retain the highest quality educators to Washington schools through full funding of competitive salaries… The State has long known that the actual cost of amply funding the basic education mandated by Section 1 would require the State to increase State per-pupil funding to at least $12,701 per student before adding inflation and capital costs. That’s the number consistent with the State’s own testimony and submission at trial. When the approximately $2 billion cost of the additional classrooms needed to implement the State’s K-3 class size reduction and all-day kindergarten components are included, that figure rises to over $14,700 per student by the compliance deadline. Thus, the McCleary Plaintiffs have claimed that the actual cost of funding our schools is at least $14,700 for the 2017 school year- which would be more than $15,000 per pupil for the 2018 school year. This converts to about $16 billion per year in total state funding. What does our Supreme Court think about the Actual Cost of Funding our Schools? Thus, our Supreme Court accepted in January 2012, the legislature’s Promise to follow through with actual funding for the Prototypical School Model by the 2018 school year. During subsequent years, our Supreme Court held the legislature in comtempt for failing to make adequate annual progress towards this goal of funding the Prototypical School model by 2018. Here is a link to all the McCleary Briefs. There are more than 60 briefs and orders filed over the past 7 years. Please read them all. The State legislature repeatedly “pinky promises” to fully fund the Prototypical school model by 2018. The McCleary Plaintiffs repeatedly warn that the legislature is not following through with their promises. The Supreme Court repeatedly states that they are relying on the legislature to keep their promise. This makes it very clear that the legislature promised to fund the prototypical school model – all $16 billion plus during the 2017 legislative session and our Supreme Court is expecting them to keep that promise by the end of this session. But that is not what is actually happening. Neither the Republican Plan or the Democrats plan makes even the slightest attempt to actually fund the prototypical school model. The Prototypical School model promised to lower Class Sizes slightly by 2018. These class sizes were further reduced by Initiative 1351 which would have put our class sizes below the national average for the first time in more than 20 years of skyrocketing corporate tax breaks. The Class Size Initiative set limits on the number of students per class, based on grade level. For kindergarten through third grade, each class was required to have no more than 17 students. In grades 4 through 12, each class was required to have no more than 25 students. Implementing these size reductions would require the hiring of approximately 15,000 new teachers and building more than 300 new schools. The loss of state funding if Initiative 1351 is repealed has been estimated by the Office of Financial Management to be about one billion dollars per year. This does not include the cost of building new schools. 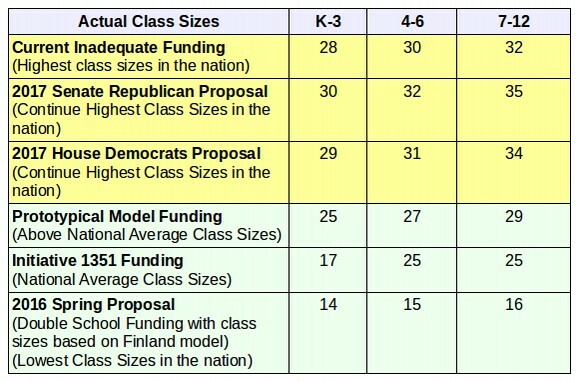 Here is the actual total per pupil funding under various proposals. Recall that current state funding is $9.2 K per pupil plus $2.1 K per pupil in Local levies for a total of $11.3 K per pupil. Because the Republican Plan contains no additional source in funding but in fact cuts funding by $1.3 billion, the total per pupil funding under their plan is about $10K per student. The Democrats plan is not much better. In terms of actual funding (versus empty promises), they roll back the Levy Lid over time to 24% instead of 28%. This results in a loss of funding of about half a billion per year (from $2.5 B in 2020 levy to $2 B in 2020 levy). Compare this to the 2012 Funding study recommendation of an increase of $6.6 billion and the 2015 OSPI study which concluded that the actual cost of funding schools was $6 billion plus another $3 billion for school construction. * Includes $2 Billion to $3 Billiob per year in additional school construction funding in order to begin to address the $30 billion school construction backlog. **For comparison, Massachusetts Per Pupil funding is $15 K excluding federal funds and excluding school construction costs. We note this because Republicans keep saying that their plan is “like the Massachusetts model.” In fact, the real funding level in the Republican plan is about 50% less than the Massachusetts model. How do these funding options affect actual class sizes? We currently have about 50,000 full time classroom teachers. 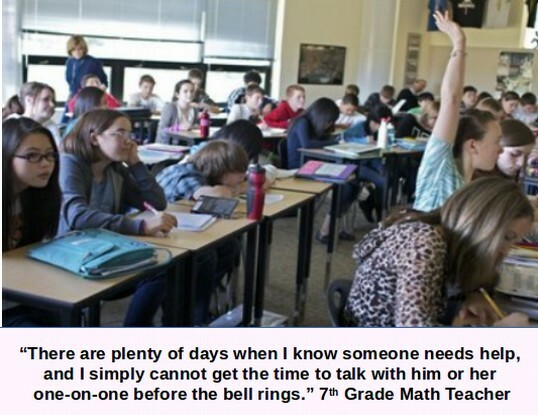 This results in the highest class sizes in the nation. Cutting a billion dollars would result in firing about 10,000 teachers. But in fact, a major problem is that teacher pay is way too low. It would take about $2 billion to $3 billion just to increase teacher pay enough to retain our current teachers. To actually reduce class sizes over and above this, would require an additional $4 billion just for a minor cut in class sizes. To really cut class sizes, we would also need to build hundreds of schools. This would require an increase of $6 to $10 billion per year. The reason I want to cut class sizes in half is because studies in both Finland and the US have concluded that cutting class sizes below 16 students per class will insure that struggling students finally get the help they need to succeed in school. Dramatically lowering class sizes is the only proven way to increase the graduation rate to more than 90%. This can easily be paid for by repealing illegal state tax breaks of the rich. Obviously, $2 billion in additional state revenue falls far short of the $6 to $9 billion increase in state revenue required to pay the full actual cost of funding schools. With no action, schools will loss $358 million in the coming school year due to an automatic reduction in local levy funds. This would be the largest cut in school funding in state history resulting in the firing of about 4,000 teachers – further increasing class sizes at a time when our state already has the highest class sizes in the nation. The House Democrats and Senate Republican bills are worse than rearranging the deck chairs on the Titanic. These bills are about throwing every child on the boat overboard and throwing our State Constitution in the water with them. 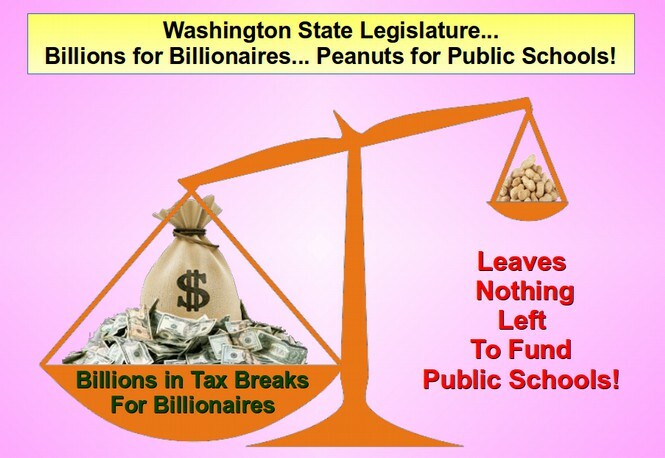 It should be apparent by now that it will take an additional $6 billion to $9 billion per year in State Funding in order to amply fund our public schools and comply with the Washington State Constitution. Where will this $6 to $9 billion per year come from? Even if the Inslee plan passed the legislature, which is highly unlikely, it would face a referendum from the voters – who have already rejected a carbon tax. 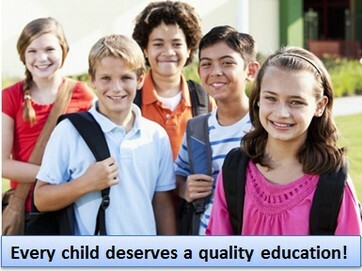 What is needed is a school funding plan that protects the middle class and at the same time addresses our real problem. While most voters do not know this, Washington state used to be 11th in the nation in school funding. Even as late as 1996, Washington state was above the national average in school funding as a percent of income. 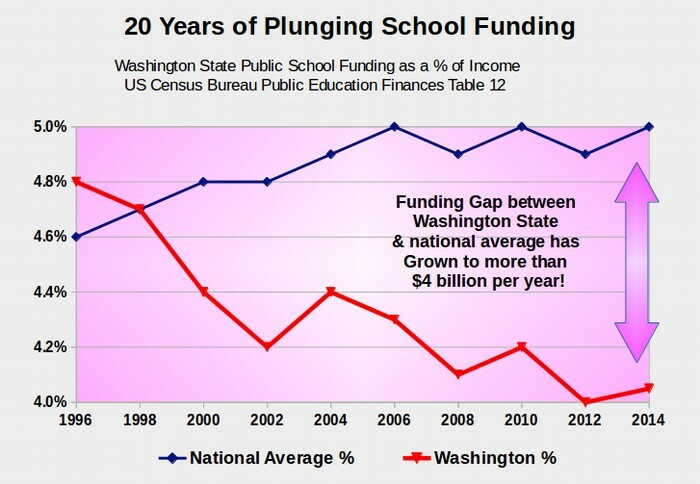 It is only in the past 20 years that school funding has plunged far below the national average here in Washington state. Why and how did this happen? We also need to ask why school funding plunged even though state and local property taxes doubled during this same time period. Some have claimed that there was an erosion of the tax base due to declining sales tax revenue. This is true. However, all of this revenue and more was made up by increasing and expanding the state Business and Occupation tax. So where did all the money go? The answer is in tax breaks for the rich. These tax breaks increased 400% from $10 billion per year in 1996 to $40 billion per year today. It was not just the Boeing tax breaks or the Microsoft tax breaks. We now have more than 700 tax breaks on the books. $40 billion per year is simply too much. It is basic math. Giving away $40 billion per year in tax breaks leaves nothing left to fund our schools. 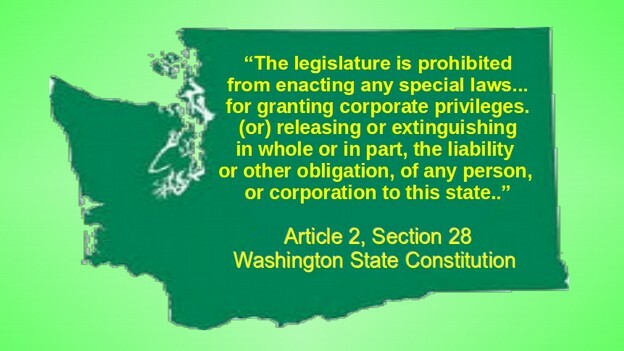 These tax breaks to wealthy corporations not only leave us with too little money to fund our schools, they are also illegal because they are a violation of several sections of the Washington State Constitution. So there are only two real options for providing $6 to $9 billion in additional revenue for our schools – either the legislature will voluntarily repeal billions of dollars in tax breaks. Or our Supreme Court should simply declare all of them to be unconstitutional. This would give our legislature enough money to double school funding, hire thousands of teachers, cut class sizes in half and build hundreds of new schools. I have written numerous articles on the amount of revenue that would be raised by repealing this single tax exemption. Here is a link to one of these articles. 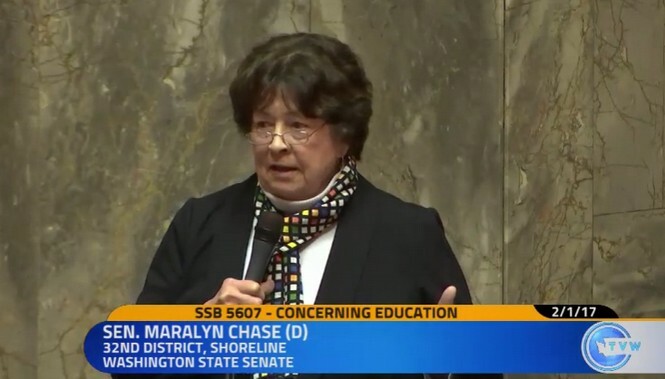 Washington state would take a bold step forward in correcting its notoriously regressive tax structure through legislation introduced today by Sen. Maralyn Chase, D-Shoreline. Washington’s reliance on a sales tax means that middle-class and lower-case households pay more than 10 percent of their net income in state taxes, while the wealthy pay less than 3 percent of their income in state taxes, Chase noted. Chase noted that intangible wealth, such as stocks and bonds, has come to represent more than half of all property wealth that has a taxable location in Washington state. 1. Keeps our tax dollars in our state, working for us rather than as a profit tool for Wall Street. 2. Cuts Wall Street bonds (profits). By borrowing from ourselves we can invest in critical infrastructure projects like roads, schools, affordable housing, water and sewer projects. We could also offer student and small business loans, and other uses for the public good. 3. It is a proven approach. North Dakota has successfully run a state bank for nearly a century, and reported its 12th consecutive year of record profits for the people. 4. Create Jobs. The Washington Investment Trust would partner with local institutions and non-profits to develop long term economic stability and create more jobs across the state. 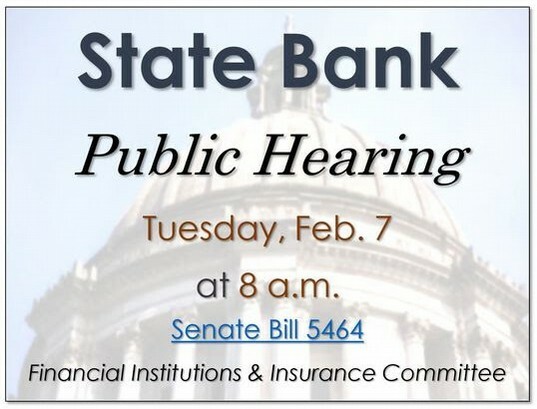 There will be a hearing on this Public Bank bill on Tuesday February 7, 2017 at 8 am. Conclusion… How did we get into this mess in the first place? In summary, both the Republican and Democrats plans gut hundreds of millions of dollars from our school funding at a time when our schools are already among the lowest funded schools in the nation as a percent of income. This is also at a time when our legislature gives away more than $40 billion per year in tax breaks for the rich. In fact, the largest of these tax breaks goes to none other than Bill Gates – the richest man in the world, who get a billion dollar tax break thanks to being exempted from paying property taxes on his $100 billion in intangible property! Thats right – we are forcing our kids to be packed into grossly over-crowded classrooms just to give the richest man in the world another billion dollars per year. How can this be possible? As a result, we have become like fish swimming in a polluted ocean of lies – hypocrisy piled on top of lunacy – which prevents us from breathing in even a single morsel of the truth. We must either jump out of this polluted pond of deciept or suffer the slow death of our democracy. Will we wake up and jump out before it is too late? One can only continue to tell the truth – and hope against hope that one day, more people will develop the capacity to hear the real truth, wake up to the lies that surruond them and rebel against their corrupt corporate masters that have enslaved them. As it says in the Bible, “The truth will set you free.” But only if we restore the capacity for recognizing the truth when we hear it. And only if we retain the courage to speak the truth when we know it. As George Orwell once said, “During times of universal deceit, telling the truth is a revolutionary act.” Before we can have any kind of real revolution, we must first learn to recognize and tell the truth. If we are to be tomrrow’s freedom fighters, then today we must spend more time in the library to better understand our real problems, our real enemies and our real options for a better future. We cannot organize if we do not know where we have come from. And we cannot lead if we do not know where we are going. We cannot fund our public schools if we try to blindly choose between the extremely bad plan offered by Republicans versus the equally bad plan offered by Democrats. Today’s problems go beyond right versus left. The real issue is right versus wrong, truth versus lies, honesty versus deceit and reality versus deliberate distraction. Today’s debate has divorced itself from reality by becoming an artificial conflict between the billionaire funded lies on the right versus the billionaire funded lies on the left. No where in this war of words is there room for real problems or real solutions. The real needs of our children for an education have been replaced by the insane drive for greed of the billionaires while the corrupt corporate media tries to decide which set of ideas is the lesser of two evils. We must learn to reject the evil on the right and the evil on the left and instead seek that which is not evil at all. We must learn to seek out solutions that address the actual causes of our economic and political problems. We must advocate for real solutions that actually solve problems rather than putting bandaids over what is now an open heart wound. If the problem is too many tax breaks for the rich, then we have to have the courage to say that the problem is too many tax breaks for the rich – and then to demand that those illegal tax breaks for the rich be repealed. If you have any questions, feel free to email me. Together, we can and will restore funding for our schools so that our kids can get the help they need to succeed in school and succeed in life.